Yahoo! Messenger is a popular software for online discussions. You can register, then login with an email and a password that can be used for Yahoo! Mail service and for Messenger. On messenger (YM) you can add contacts and start online conversations. The communication can be done through text, voice and video. Users can send or receive files. You can activate your webcam for all or for some users from your contacts list, also you can view real-time images (the webcam) of others, if they share it to you. 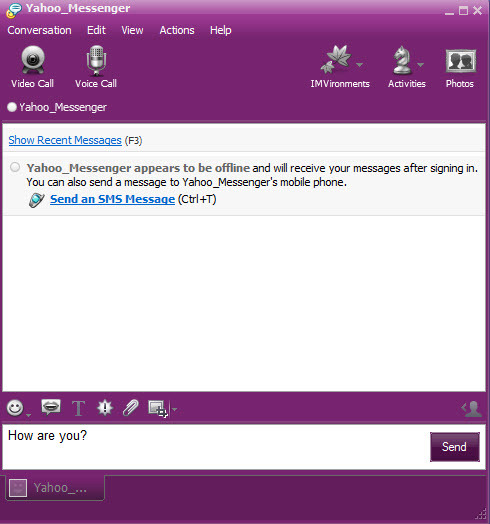 The program supports text formatting and emoticons, includes links to games, radio stations and other online Yahoo services such as their email service. Launched in 1998, Yahoo! Messenger was the most popular messenger for a lot of time, but later on other useful messaging clients were released such as Skype (acquired and maintained by Microsoft) or Google Talk (discontinued by Google, now available as Google Hangouts). YM still remains a friendly and easy to use messenger. Yahoo! Messenger is available as free download for Windows 32-bit and 64-bit. Yahoo! Messenger is 100% clean and safe to install. You can see the test results here.